The Rev. Ginny Wilder held her first service as Priest at St. Anne’s on Sunday, September 24, 2017. 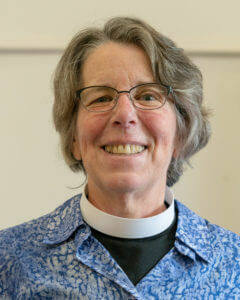 A native of South Carolina, Ginny came to Winston-Salem after serving as associate Rector at Trinity Episcopal Parish in Wilmington, Delaware since May 2012. In the Diocese of Delaware, she served on the Bishop’s executive council, the diocesan council, clergy development team and was an active member of the Practical Approaches to Cross Cultural Transformation ministry. Ginny believes her call is to help build community both on and off the church grounds using creative means to bring God’s people together. Prior to entering seminary in 2009, she had been training and development manager for Biltmore Estate Information and Sales Center in Asheville, N.C. Ginny also holds a B.A. in sociology and anthropology from Warren Wilson College and a M.S. in human resources development from Western Carolina University. In addition to being a priest, she is also a musician who has released seven albums. Ginny and her wife, Barbie, are excited to be a part of the St. Anne’s community and actively participate in the rich faith and civic life available in Winston-Salem. 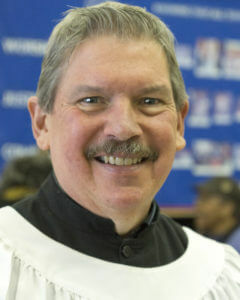 David Pegg is Minister of Music at St. Anne’s Episcopal Church. David received his Bachelor and Master of Music degrees from the University of North Carolina at Greensboro, and has done advanced studies at the University of Oklahoma, University of Iowa, University of Hartford, and Westminster Choir College. He is the former conductor of the Bel Canto Company, a professional choral ensemble of Greensboro, NC, which he led for 19 years. He has served on the faculties of the University of North Carolina at Greensboro, High Point College (University), Kent State University, and Salem College. For 17 years he served as Director of Music and the Arts at Centenary United Methodist Church of Winston-Salem. He is the previous conductor of the High Point Community Chorus. David has been a choral clinician and adjudicator for numerous workshops including the North Carolina All-State Chorus and Honors Chorus, Kentucky All-State Chorus, and Indiana All-State Men’s Choir. His choruses have sung on programs of the Music Educators National Conference, southern division conventions of the American Choral Directors Association, and the Spoleto Festival in Charleston, South Carolina. In 2004, he received the Lara Haggard Award for Distinguished Service in Choral Music in North Carolina from the North Carolina state chapter of the American Choral Directors Association. Mary was a member of St. Anne’s from late 1974 until her ordination in May 1991. Mary did her discernment for the diaconate among the community of St. Anne’s. She has served as a deacon in various capacities since 1991 and as of April 2018 Mary serves as St. Anne’s deacon. Welcome home, Mary. Below is some information about Mary. “I have three adult daughters and five grandchildren. You may encounter me on local and mountain trails since I frequently hike. My time in nature offers a wondrous sanctuary for prayer and reflection. I am semi-retired and work only a couple days a week as a physical therapist. Throughout my career as a physical therapist, I have worked in a state psychiatric hospital, in homes, and in hospitals. These various settings have helped shape me for ministry with the dying, and those who experience loss. In the past two years, I have branched out to tutoring students at my neighborhood Title 1 school. (PSA: Teachers can always use help!). Tutoring has opened my eyes to the inequalities of our local schools. 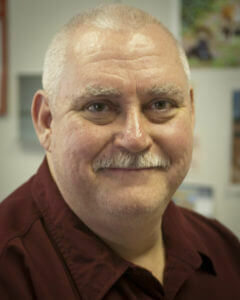 Mark has been Parish Administrator for St. Anne’s since 2002. As Parish Administrator, he serves in various financial and administrative capacities. Mark is also a musician and wears a variety of musical hats as a performer, composer and teacher. He studied oboe in high school at UNCSA and continued his training in Ohio, earning a doctorate at Cincinnati College-Conservatory of Music. Currently, he is a freelance musician in North Carolina, performing with the Piedmont Wind Symphony and other orchestras and chamber groups. As an instructor of music theory, history, music technology and music appreciation, Mark has taught at Cincinnati-College of Music, the University of North Carolina at Greensboro and at Forsyth Technical Community College. He also enjoys teaching in his modest oboe studio in Winston-Salem, and is proud of his students who consistently win statewide competitions and auditions.